We had Parent/Teacher Conferences this week for Mary Virginia's school. I am always proud of both kids, but I also love to get feedback from their teachers! MV is doing wonderful, just as I thought! She loves school and loves her teacher! On Friday, MV's school had a Veteran's Day Celebration and lunch. Ed was able to go to school with MV for a picnic lunch and then watch a program to honor our Veteran's. Of course, we forgot to take pictures! John Bay's school has been celebrating community helpers. 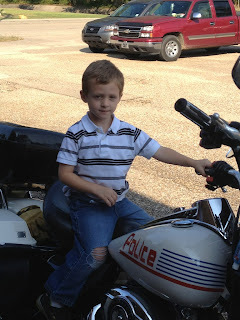 Although he loved the firemen, he has not stopped talking about riding the police motorcycle! It was another fun week of school, activities and horseback riding!